A busy week turned out to be a very big week for the Boone Central/Newman Grove softball team. Not only did the Cardinals win five consecutive contests, running their current streak of success to seven games, but also avenged their only loss of the season and captured the Boone Central Invitational tournament championship. BC/NG opened the week Tuesday hosting Blue River (David City) and paid the Panthers back for an earlier defeat with a thrilling 8-5 come-from-behind victory. The Cardinals trailed 5-4 entering the bottom of the sixth inning, then used a dramatic rally to flip the lead. Stephanie Wright reached on a two-out single and scored on Lauren Hedlund’s triple to tie the score. Emily Groeteke then doubled home the winning run and Claire Choat provided insurance with a two-run home run – her fourth hit of the game. Boone Central/Newman Grove continued its win streak Thursday, rolling past visiting North Bend Central 10-0 in four innings. 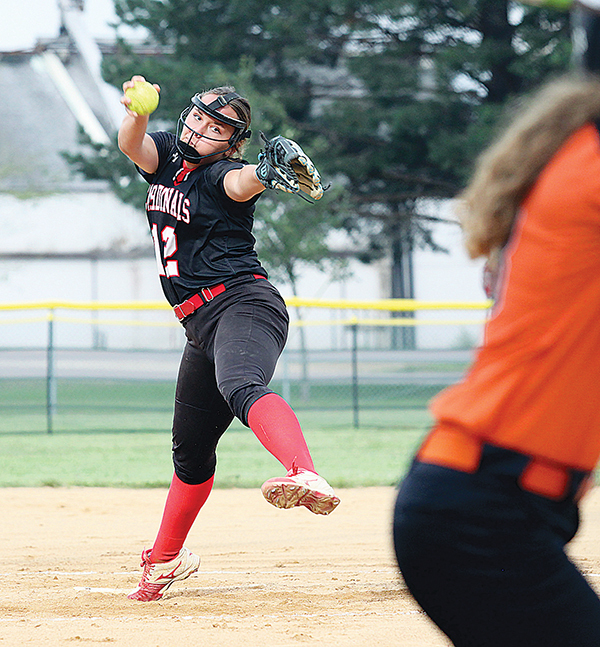 The Cardinals all but decided the verdict in the first inning, as Keiley Tisthammer’s grand slam with Choat, Karlie Tisthammer and Brooke Groth aboard highlighted an eight-run inning. Emily Groeteke had mound honors in this contest and shut down M/H/LHF on three hits, while fanning six batters. Pierce, a 15-1 loser to Boone Central/Newman Grove one week earlier, scored three times in the first inning Saturday morning and trailed just 4-3 through frames. The Cardinals ended any Bluejay hopes in the fourth, however, pushing 10 runs across the plate for a 14-3 victory. Boone Central/Newman Grove (10-1) completed its tourney sweep with a 9-1 win over Polk County Saturday afternoon. Lauren Hedlund got the Card party started, popping a solo home run in the first inning and adding a two-run blast in the second. Leading 4-1, Boone Central/Newman Grove secured its seventh straight victory with a five-run third as Miller doubled and Ashtyn Hedlund connected for a two-run triple.